"Do you ever sleep? You answer my e-mail faster then I can write it. One thing that impresses me about your firm." - M.G. "I'm in love! There is no comparison between this and my old flowchart program, which I thought was great! Edge is out of sight by comparison. So intuitive, so flowing. My first flowchart was a spectacular success and I spent almost no time struggling with the application. It's like it was invisible!" "I must say that I am very impressed with the ease of use and total flexibility of the program." - J.M. "Flowcharting has never been easier; or more fun. This may be my last contact with you; sad to say (-;. Edge handles so well, and is so "intuitive", that, I have sailed right through most of my flowcharting sessions without a hitch." - M.C. "I love the tool so much. I spent a lot of time to search a good tool for our needs. Finally, I found EDGE can fulfill almost all the necessary functions." - W.C. of V.I. "It works good! Your Program is more suitable for my actual tasks (Entity relationships, Data flow, Doc. flow, Process flow etc.) than ABC Flowcharter or Visio Express for example." - M.M. "I have been trying your product and am extremely impressed with its functionality and ease of use." - S.R. of R.P. "Thank you for being there! Great product for management." - D.H. of M.M.H. "Your EDGE Flowcharter software is something to talk about. I really like the way it allows the creation of figures." - R.H.
"I've been testing your software EDGE Diagrammer. I think your product is the best that I've used in a long time. Our company has ABC Flowcharter and Allclear. I use Visio privately. But I get the job done pronto and in a simple way with Edge Diagrammer." "I LOVE your program. I am in the tenth grade learning computer programming and I am taking a Logic course. I used your program to make a flowchart for school and it looks GREAT!" - N.W. "I would like to comment on how user friendly the software is. It makes a nice change in the computer age to have a software package that can be operated with such ease and efficiency." - A.F. "I would like to put a downloadable trial of this software on my webpage. It is one of the handiest programs I ever tried." - A.D.
"WOW! I am VERY happy with this and the speed with which you have responded. There was mention around the shop and are even now conversations that sound like this: 'Don't you wish Microsoft was that way. ', 'Responsive, documented, quality, that's uncommon.'" - M.W. "I like what I see. I've been looking for something like this for some time, and have even invested in some programs that turned out to be junk." "Thank you for being there! Great product for management." - M.S. "I really appreciate Edge Diagrammer. It works the way I think. I can get a lot of concepts and their relations down quickly and effortlessly. Once I have what I'm thinking on screen, Edge Diagrammer works like a kind of visual storage for me, freeing up cognitive resources for thinking rather than remembering. I appreciate that as my diagrams become more complex, they are easy to rearrange and, if necessary, link. I use Edge Diagrammer for many things, but mostly to visualize my ideas in software development. I like I can easily see, for example, flow of interaction in the software I'm building, which makes it easy to identify holes in my thought processes, or areas of the diagram that need to be considered more carefully." - D.R.B. "This is by far the best diagraming software I have ever worked with and I thought I had the BEST. Your software is so versatile that it is not only useful for normal systems design but is an excelent tool for planning computer site installations. I have only been using your software for 3 days and already I can not stop telling people about this amazing program." - M.F. "It has all it needs. It's small, you can master it in a few minutes and MOST important, IT DOES WHAT YOU NEED!" 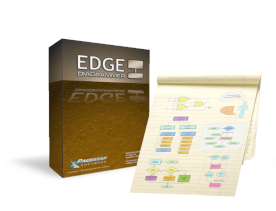 "EDGE is a versatile and easy to use flowcharter which meets most of my demands. CONGRATULATIONS!" - P.M.